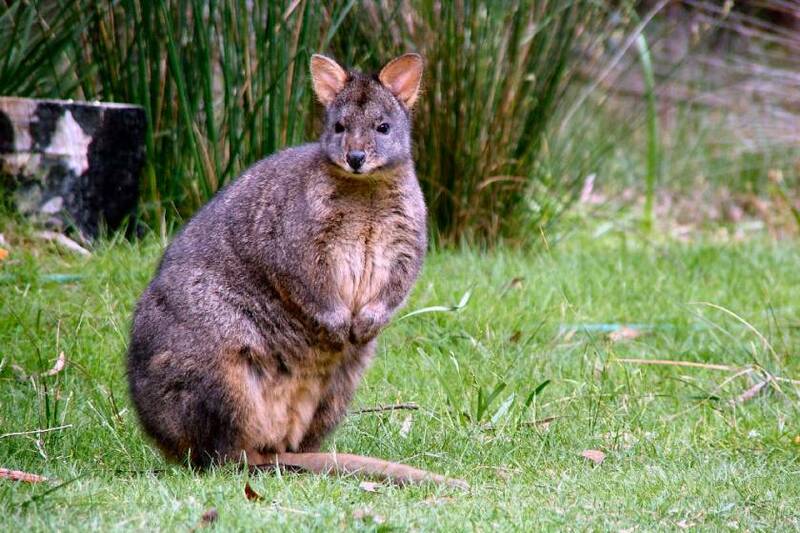 The pademelon (Thylogale billardierii) is a stocky animal with a relatively short tail and legs to aid its movement through dense vegetation. It ranges in colour from dark-brown to grey-brown above and has a red-brown belly. Males, which are considerably larger than females, have a muscular chest and forearms, and reach up to 12 kg in weight and 1 - 1.2 m in overall length, including the tail. Females average 3.9 kg in weight. The unusual common name, pademelon, is of Aboriginal derivation. It is also sometimes referred to as the rufous wallaby. Pademelons can damage crops and pastures in many parts of Tasmania, and as a result come into conflict with landholders. This species is extinct on the mainland because of predation by foxes and large scale land clearance, although two other species occur along the east coast of the mainland. In Tasmania, however, the pademelon is both widespread and abundant. Although partially protected, hunting is allowed.